Earth today is one of the most active planets in the Solar System, and was probably even more so during the early stages of its life. Thanks to the plate tectonics that continue to shape our planet’s surface, remnants of crust from Earth’s formative years are rare, but not impossible to find. A paper published in Nature Sept. 2 examines how some ancient rocks have resisted being recycled into Earth’s convecting interior. Throughout the world there exist regions of ancient crust, referred to as cratons, which have resisted being recycled into the interior of our tectonically dynamic planet. These geologic anomalies appear to have withstood major deformation thanks to the presence of mantle roots. A mantle root is a portion of Earth’s mantle that lies beneath the craton, extending like the root of a tooth into the rest of the underlying mantle. Just like a tooth, the mantle root of a craton is compositionally different from the normal mantle into which it protrudes. It is also colder, causing it to be more rigid. These roots were formed in ancient melting events and are intrinsically more buoyant than the surrounding mantle. The melting removed much of the calcium, aluminum, and iron that would normally form dense minerals. Thus, these roots act as rafts bobbing on a vigorously convecting mantle, on which old fragments of continental crust may bask in comparative safety. However, geophysical calculations have suggested that this buoyancy is not enough to stop destruction of the mantle roots. According to these calculations, the hotter temperatures that are widely thought to have existed in Earth’s mantle about 2.5 to 3 billion years ago should have warmed and softened up the base of these roots sufficiently to allow them to be gradually eroded from below, leading to their eventual destruction as they were entrained, piece by piece, into the convecting mantle. A stronger viscosity contrast between the root and the underlying mantle is required to ensure preservation. In the Sept. 2 issue of Nature, Anne Peslier, an ESCG-Jacobs Technology scientist working at NASA-Johnson Space Center and her colleagues David Bell from Arizona State University and Alan Woodland and Marina Lazarov from the University of Frankfurt, published measurements of the trace water content of rocks from the deepest part of a mantle root that offer an explanation for this mystery. The researchers used samples found in diamond mines of Southern Africa, where the ancient crust of the Kaapvaal craton was pierced about 100 million years ago by gas-charged magmas called kimberlites. These magmas were generated at depths of about 125 miles (200 kilometers) beneath the mantle root and ascended rapidly (in a matter of hours) through the Earth via deep fractures, bringing with them pieces of the rocks traversed, including diamonds. After erupting explosively at the surface, the magmas solidified into the pipe-like bodies of kimberlite rock that were subsequently mined for their diamonds. The mantle rocks analyzed by the team were transported from a range of depths down to 125 miles (200 km) below the surface, where they had resided since their formation around 3 billion years ago. 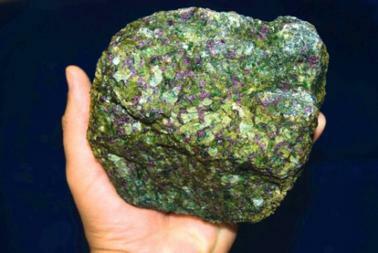 The samples of rock called peridotite are composed mainly of the mineral olivine, with minor quantities of pyroxenes and garnet. Olivine is, because if its abundance, the mineral believed to control the rheological properties of peridotite. What Peslier and colleagues found is that beyond a depth of about 112 miles (180 km), the water content of olivines begins to decline with depth, so that the olivine in peridotite samples from the very base of the cratonic mantle root contained hardly any water. That makes these olivines very hard to deform or break up, and may generate the strong viscosity contrast with that geophysical models of craton root stability require. Why the bottom of the mantle root has dry olivines is still a matter of speculation. One possibility, suggested by Woodland, is that reducing conditions thought to prevail at these depths would ensure that fluids would be rich in methane instead of water. Bell suggests that melts generated in the asthenosphere, such as those eventually giving rise to kimberlite eruptions, may scavenge any water present while passing through the base of the cratonic root and transport it into the overlying shallower mantle. These results reiterate the belief shared by many scientists that knowing how much water is present deep in terrestrial planets and moons, like Earth, Mars or the Moon, is important to understanding their dynamics and evolutionary history.